20 • RV PRO • March 2017 rv-pro.com R V M A N U F A C T U R E R S T here has been a sea change at Winnebago Industries since Michael Happe was hired as president and CEO in January 2016. Most notably, Winnebago acquired Grand Design for about $500 million in November, greatly expanding the RV maker's presence in the growing towables market. Still, there has been a multitude of other notable developments as well, including the start of motorhome production in the former Country Coach facility in Oregon, and several strategic new hires designed to propel the company's growth moving forward. 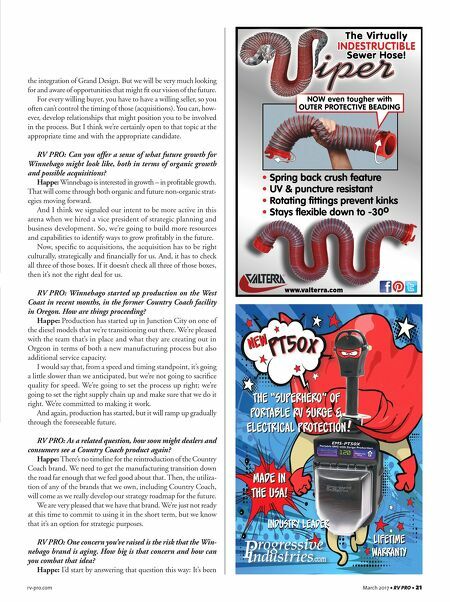 Recently, RV PRO spoke with Happe at length about those many developments. His responses below have been edited for clarity and condensed. RV PRO: Now that you have added Grand Design into the fold, will it and Winnebago Towables offer comple- mentary products, or will they compete head-to-head for market share, as divisions of Forest River and Thor do, for example? Happe: Here is my philosophy on that: Winnebago Towables' market share is just over 1 percent. When you add in Grand Design's share we may have 5 to 6 percent share in towables. That means we have 94 to 95 percent of the market that is not buying a towables product from us at this time. So, we should absolutely be focused on the rest of the market, versus battling over our own brands. It's important that, inter- nally, we very much are disciplined about how each brand and its product lines are different and complementary. But, we need to be focused on the entire end customer set and convincing customers that either of these two brands is the right choice for them. With 95 percent of the customer market currently choosing to buy from another company, there's plenty of oppor- tunity for us to compete for that without cannibalizing ourselves. RV PRO: At $500 million, Winnebago's acquisition of Grand Design represented a substantial investment. Is Win- nebago open to further acquisitions in the near-term? Happe: We've just made a major acquisition (Grand Design), so we have a balance sheet that looks different today than it did just a short time ago. So, we need to de-lever a bit and focus on The RV maker's president and CEO offers insights on the Grand Design acquisition, starting up West Coast RV production and other strategic initiatives. 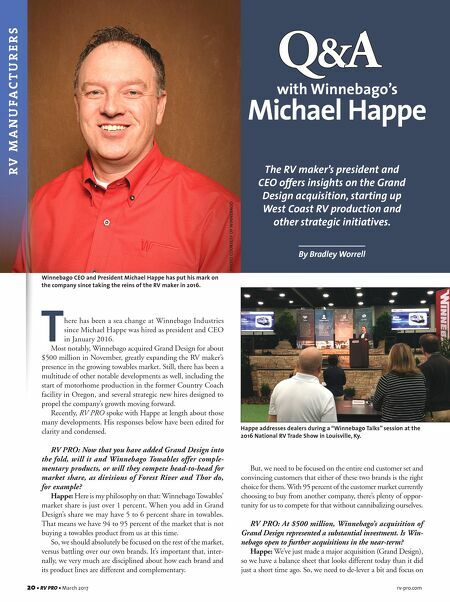 By Bradley Worrell Q&A with Winnebago's Michael Happe Winnebago CEO and President Michael Happe has put his mark on the company since taking the reins of the RV maker in 2016. PHOTO COURTESY OF WINNEBAGO Happe addresses dealers during a "Winnebago Talks" session at the 2016 National RV Trade Show in Louisville, Ky.